Summer is here! 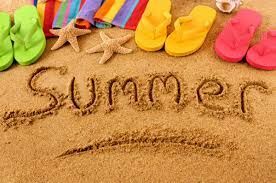 You can start planning now to have a fun summer with lots of activities to keep up your child’s learning outside of school. Summer is an exciting time for children, but for some the change in their daily routine can be a difficult transition to make. Having summer plans and a routine for the day can help children make the transition. Talk with your child about this transition and find ways to help your child be part of the planning for their summer activities. Look for summer camps and activities offered for children at local libraries and museums. Check your local library for summer reading programs and other activities. The Museum of Life and Science in Durham has wonderful activities for children of all ages and Kidzu is a great place for young children when the weather is too hot in the middle of the day to be outside. Try a summer chore chart and schedule. Decide with your child what chores and responsibilities they will have around the house during the summer. Stay consistent. Create a summer schedule so your child knows when to expect meal times, activity times, and sleep times. Keep rules and consequences consistent over the summer. Spend quality time together. Try 10-15 minutes uninterrupted (put your cell phone away ;) ) doing something your child wants to do. Get active! Plan ways for your child to be active daily. Have fun in the kitchen. Children can help cook and bake. Have them measure, count, and divide/multiply ingredients as well as reading recipes. Get outdoors. Foster curiosity by exploring nature and looking at the world around us. Create an outside scavenger hunt for your child to complete, have a picnic, or observe animals and how their behavior changes with the temperature. Do experiments with household items. Try journaling. Have your child keep a summer journal with writing time each day. Your child can record the books he or she reads along with a short summary. You can also keep a summer activity journal to record what you did each day. Make art work creatively. Use recycled items or other things that would be thrown away to create sculptures and art projects. Build forts outside the house or inside the house. Keep babies cool and remember to use clothing, hats, blankets, and shade to protect them from sun. Plan activities around the sun and heat. Take babies outside during the morning and early evening hours. Go for walks with your baby. Describe what you see outside. Let your baby touch plants and trees to feel different textures. Take a picnic outside with a large blanket for you and your baby. Consider your baby’s temperature in their car seat. Some babies are not happy travelers during these warm months because they get hot in their seats. Using back seat air vents or a clip fan can help your baby feel more comfortable. Use small pools with very little water for babies who are able to sit on their own. Enjoy making memories this summer with your little one!